Lord, bring us our reprieve. When will the rain please come? What’s due to come about? A couple inches, you bloody beaut! I’ll listen up all night. She’s really set up camp. But rain, please go away. Dead wildlife on the ground. Drive up here, see our pain. The sunshine has come out. Coming out of a hot dry summer, March weather is beginning to soften the sky and offer the cooler, more gentle mornings of autumn. There is no definite change of season, just a calmness, almost a feeling of relief after the insistent tropical heat. Apart from, whack, an insect, there’s something serene and relaxing about strolling through a garden, touching leaves, sniffing flowers, following a creek and hearing the splash of a small waterfall through the trees. Arriving early at the Brisbane Mt Coot-tha Botanic Gardens, I strolled through a cool, green gully and thought it was strange to be in a capital city yet hear no traffic sounds. I floated along, enjoying the stillness, until my personal calm was shattered when the garden crew came on duty and the leaf- blowing brigade roared into action. I had to wait until one fellow walked out of shot to photograph Xanthorrhoea australis, the Grass-trees (below; left). The atmosphere shuffled its feathers and tranquility returned. Leisurely, I followed the meandering paths across bridges and green lawns, enjoying the mild sunshine. Strolling down a slope, I came to a bracken-lined watercourse then walked up a gentle incline towards king ferns, piccabeen palms and towering hoop pines. I’ve never fully traversed the 56 hectare (138 acre) area which displays mainly eastern Australian plants. You can spot Eastern Water Dragons (lizards) and geckos as they scurry out of sight or get a giggle watching the many varieties of water fowl, ducking and diving in the lake. Feeding wildlife is not allowed and I couldn’t entice them into an appealing photograph. Sculptural features are ‘casually’ placed throughout the gardens and I think the most alluring is a silver fern seat (below; left) with interesting support. The Japanese Garden (below; entrance and pond) offers soothing symmetry and a waterlily’s single bloom. Nearby the concert bandstand has grass seating surrounded by trees with foliage of different patterns and colours. Around me, there’s a multitude of subtropical shrubs, cycads and flowers with names I never remember. You will notice that I do not attempted to be horticultural! A bit further along, in the arid zone, resides a sci-fi concoction of exotic cacti. The culinary, fragrant and medicinal herb gardens are pure indulgence. But if herbs aren’t your thing, the pungent eucalypt is my favourite and walking the Aboriginal Plant Trail with its edible food plants. The stillness of the morning created pleasing reflections on the lagoon which is fed by rainwater captured from the hills. You can choose between typical heathland or wetland regions made easily accessible for suburban folk. The Conservation Collection includes rare and endangered species in their natural habitats and I entered the steamy, geodesic hothouse (below; left) where equatorial plants are nurtured. My face beads in sweat, it’s not a place for humans to linger too long. Time for an ice-cream! Tropical Display Dome at Brisbane Botanic Gardens, Mt Coot-tha, is a large lattice structure (geodesic) displaying plants from the tropics. A pathway winds upwards through the dome building, wrapping around a central pond with water plants. Outside the entry are several buildings of interest: Sir Thomas Brisbane Planetarium (below; saved from extinction by a vocal community uprising) large carpark, small art studio, specialist library and auditorium providing a variety of events. I have booked a place in a workshop Monoprinting Australian Native Plants, so a blog post may be forthcoming. The new Visitor Information centre offers guided walks and Gardens Café has the ice-cream. The two white-coated fellows outside the café are entomologists, surviving statues from World Expo 88. The Mt Coot-tha Botanic Gardens Children’s Trail is a hide-and-seek ramble through the shady rainforest garden with special works of art dotted along the way and I couldn’t resist following it myself. Check out the wacky weathervane! And a log for native stingless Sugarbag bees. Mother and baby Panda bears enjoy the bamboo; they are a special fabrication of laser-cut aluminium by Australian sculptor Mark Andrews. Parks and gardens change with horticultural trends. The smaller City Botanic Gardens are older and more formal, in keeping with the style of previous centuries, but I prefer the softness of Mt Coot-tha Botanic Gardens. As the world becomes more populated and natural plant life decreases, Brisbane city dwellers like me need our botanical gardens to nourish and refresh our screen-dependant interior lives. Note: Please click or tap an image to enlarge. You may also like to read about my visit higher up the road at Mt Coot-tha Lookout. Today 11/11/2018 is the Centenary of Armistice and Remembrance Day in Australia. My grandfather heading off to war. At 11am on 11 November 1918 the armistice treaty, which Germany had signed earlier that morning, came into effect. The Great War, the ‘war to end all wars’ which had begun on 28 July 1914 was finally over. Like millions of other Australians, I’ll follow tradition and observe a two-minute silence at 11am (no matter where I am) to honour the 420,000 men who enlisted and the 62,000 who didn’t return. A local newspaper notice attracted my attention. Did I read that correctly? A camel farm excursion? Here is the true story of my expedition into camel territory. I’d heard about camel milk and wanted to know more, so I contacted the organiser National Seniors secretary. Of course, they had me at “camels” but when I see meals included, I’m there. The itinerary read “East Coast Coach depart 9am and arrive Summer Land Camel Farm, Harrisville, morning tea and guided farm tour. Lunch at Commercial Hotel (adjoining Thirsty Camel bottleshop) before travelling home via scenic route 4pm.” Hooked and booked! On boarding the coach, I was given a warm National Seniors welcome, and on disembarking the coach 45 minutes later, the first thing I noticed was the vast blue sky over Summer Land Camel Farm. A rolling vista spread out around me. In the distance the smudged outline of the Scenic Rim, part of the Great Dividing Range, and in the foreground hundreds of camels! It was an odd sight, camels of different sizes grazing in the paddocks, until I realised they were at home in the landscape. Now, first let’s clear up some camel falsehoods. Camels do not spit but alpacas do. Camel footpads are better suited to protect vegetation than cows and horses. Of course, it’s common knowledge that a camel can walk over a hundred kilometres without water and carry heavier loads than a horse. But did you know that they are excellent swimmers? Who’d have thought but it’s true. We strolled to the beautiful old Queenslander homestead where a spread of fresh scones, homemade jam and cream awaited. Then we realised what we were eating. The white fromage cream I dobbed on my scones and the milk in my coffee were not from a dairy cow but a camel. Delicious! And, as we subsequently found out, very good for our digestive tract. Camel milk is like an immune boost, an anti-inflammatory which can benefit our gut, skin and hair. I loved meeting the camels at the fence, talking to them as they blinked their long eyelashes, obviously assessing if I had anything edible in my hand. When they saw the camera, I believe they actually posed, holding quite still while I took full advantage of this photo opportunity. See the camel on the right smiling! Everything was peaceful and the air smelt fresh. No camel aroma wafting on the breeze. Then my models wheeled away to check out an inviting dust bath. In Australia we have dromedary camels, one hump. The dromedary is the smaller of the two species of camel and female gestation period is 13-14 months or around 410 days. I saw a baby camel, 24-hours old, all spindly legs, wobbling and flopping yet determined to stand. I asked if I could sponsor a camel, an adorable critter to watch grow up. Not yet, but one day this may be possible. In the meantime I joined the Summer Land Camels Club and harbour happy thoughts of riding a camel on my next visit. Jeff Flood, CEO Summer Land Camel Farm, Business Strategist, Biochemist and Nutritional Immunotherapist. Our group walked to a vast shed where the cheese, cream and milk are tested and processed. We sat in the breezeway while Jeff Flood, biochemist and immunotherapist, delivered an intelligent, informative and heartfelt talk on all things camel. Even biomes got a mention, and Jeff is very open about the farm operations. I wished my school days had involved such an absorbing field trip. A passionate cameleer from a farming background, Jeff Flood is CEO and co-founder of Summer Land Camel Farm, the largest of its kind in Australia. Apart from playing rugby and completing several scientific degrees, he discovered that the immune protein and nutritional content of camel milk has healing benefits, showing positive results when used to treat his young son’s eczema. Then onward to the open-air camel dairy, where we learned the long road to milking. Camel milk and by-products are not high volume in Australia but its the largest commercial-scale camel dairy operation outside the Middle East and the third largest of its kind in the world. Jeff and co-founder Paul Martin are training wild camels, breeding, researching, testing and pioneering the way. Not only for Australia but the rest of the world. Why can’t camel milk sit in the fridge next to other beverage flavourings? Camellatté has a nice ring to it. Jeff is concerned for the welfare of camels and told us some horrible yet true stories of the brutal decimation of the wild camel population in Australia. The camel is a neglected animal among the policymakers. Incorrect data is perpetuated to this day, mainly through ignorance and government propaganda. During the tour, it became obvious to me that camels have been given a raw deal. They are well-suited to our Australian climate and in some ways more beneficial than imported European farm animals. A bit of racism involved here? Camels do not have top teeth yet they like rugged food; they can eat feral weed plants such as prickly pear and they don’t need lush green pastures to thrive. During drought years, companion-herds of camels and cows survive better. Camels can act as watchdogs, they have the intelligence of a six year-old child which is greater than a dog. Plus they can take you on very, very long walks! Back at the homestead, we enjoyed some taste-testing and Summer Land Camel Farm staff excelled with their hospitality. Unlike almond milk or soy milk, I had an instant attraction to camel milk. It suited my palate without the “I’ll get used to it” phase. Being lactose-intolerant, that’s a blessing. I perused items for sale; from camel milk and cheeses through to soap, hand-cream and artwork by Fiona. If you forget the Esky, cold bags can be purchased for a nominal amount and my Camel Persian Feta and other goodies were safely tucked away. Time to head off down the road and partake of a pub lunch at the Commercial Hotel in Harrisville. After our meal, we strolled around the small township. I looked left and right before crossing the road but it wasn’t really necessary. The coach swayed gently as we headed homeward, and I was pondering this enjoyable day out when my thoughts reached a conclusion. I had looked into the eyes of a camel and seen a friendly, interested gaze. I think the world needs more friendly interest in camels. And more camel milk in coffee! Stop the Press – My camel post has been used online and print issue by Your Time 55+ Magazine – Read all about it. “Stella Montgomery is in disgrace. The awful aunts, Aunt Condolence, Aunt Temperance and Aunt Deliverance, have sent her to Wakestone Hall, a grim boarding school where the disobedient are tamed and the wilful are made meek. But when a friend disappears, Stella is determined to find her – no matter what danger she encounters. Soon Stella is thrown headlong into the mysteries surrounding Wakestone Hall. Stella Montgomery and Wakestone Hall – the intrigue draws to an exciting close! Wakestone Hall is Book 3 in the Stella Montgomery Intrigues and this series has captured my imagination. My inner child responded to the mysterious and creepy goings-on in the first two books, beautifully complemented by author Judith Rossell’s own illustrations of the Victorian era. The third book is out now with a book launch due in a couple of days. I can’t wait to read it! GBW. On Sunday 28 October 2018 at 3pm The Little Bookroom, Melbourne, is proud to launch WAKESTONE HALL the third book in the Stella Montgomery trilogy by author and illustrator Judith Rossell. Read the book and find out the significance of the purple ribbon. The Koala is a laidback leaf-muncher who gets hassled by the bad boys of the Aussie bush. Not by other native animals but tree-lopping developers and domestic pets. Koalas are a unique marsupial which needs human protection to survive. And eucalyptus trees, of course. Greeted by mother and baby on arrival at Lone Pine Koala Sanctuary, Brisbane. On this visit I didn’t hug a real Koala but you can! The Koala (Phascolarctos cinereus, not a bear) is an arboreal herbivorous marsupial native to Australia. It is the only extant representative of the family Phascolarctidae and its closest living relatives are the wombats. “United by a common purpose to conserve koalas across their range, Lone Pine Koala Sanctuary and Brisbane City Council worked together to build and establish the Brisbane Koala Science Institute, located at the sanctuary in Brisbane, Queensland. The Institute and this online community are further supported by Lone Pine’s not-for-profit organisation, the Research for Nature Foundation, which will help fund various South-East Queensland koala projects, in partnership with local scientists, researchers, and industry professionals. At the unique Brisbane Koala Science Institute at leafy Lone Pine, I was pleasantly surprised at how much Koala information I absorbed in a short space of time. There are interactive (and multilingual) displays, research labs with public viewing areas and a koala observation area. ♥ Koalas have special teeth for grinding down eucalyptus leaves which ferment creating sleeping patterns which mean they can sleep more than 18 hours a day. ♥ Koalas have large, strong claws to help them climb smooth-barked eucalyptus trees. ♥ A Koala baby, joey, lives in the mother’s pouch for six months then grows up to become a big eater, consuming about one kilogram of eucalyptus leaves per day. ♥ Koalas front paws can grip small branches as they reach for the juiciest leaves. ♥ Koala lifespan is between 10 to 16 years which naturally depends on environmental conditions. This Blue-Winged Kookaburra swooped down and kept a watchful eye on our lunch, however, it’s best not to feed human food to native wildlife. Afternoon tea, two coffees and two muffins, one caramel and the other blueberry, both with edible chocolate circles iced on top. The wishing well outside the front entrance to Lone Pine Koala Sanctuary with plenty of coins and “I Love Australia” badge. A quick guide to the wild birds around Long Pine Koala Sanctuary. Behind the sign, an Eastern Water Dragon lizard came out to sunbathe on the brickwork. You can adopt a Koala through Australian Koala Foundation. Thank you, Lone Pine Koala Sanctuary for a relaxing, informative and enjoyable visit. These vivid flowers would be perfect at Christmas time. But, no, this spectacular red Callistemon, an Australian native Bottlebrush, flowers in springtime and early summer. It has long fluffy tubular flowers that look beautiful in gardens and taste delicious to all kinds of native birds, insects and other wildlife. The flower 'brushes' are so soft, not spiky at all. There were two Rainbow Lorikeets hiding in the branches, eating the nectar and chatting away, but they wouldn’t keep still for a snapshot. I saw this long row of flowering plants in an industrial-type setting in Brisbane yet Callistemon grows in every location, tall shady trees to knee-high potted shrubs and used as groundcover. Information from this website Australian Plants Online Flowering Callistemon indicates that I’ve photographed 'Hannah Ray' which is 4 metres high and suitable for streetscapes. It brightened my September day! 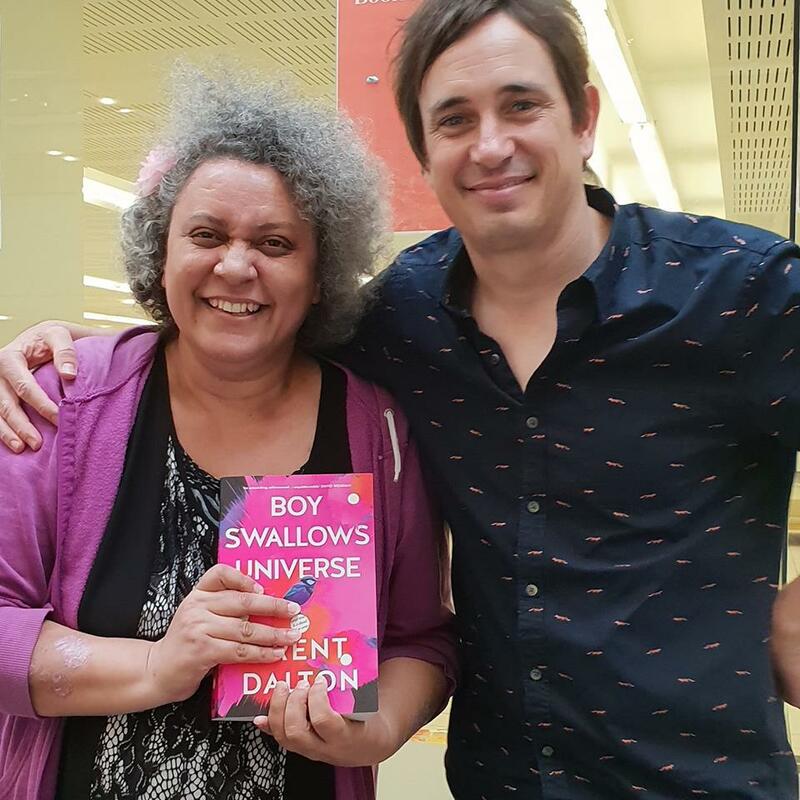 So the absolute highlight of the Brisbane Writers Festival for me was the talk I attended by Trent Dalton. I saw Trent a few weeks ago on Q and A, on the ABC, as well as Sofie Laguna, and was so impressed by the way they both conducted themselves on the panel I set out to look up their books. When I heard Trent would be attending and presenting at the Brisbane writer’s festival he went right to the top of my must-attend sessions. 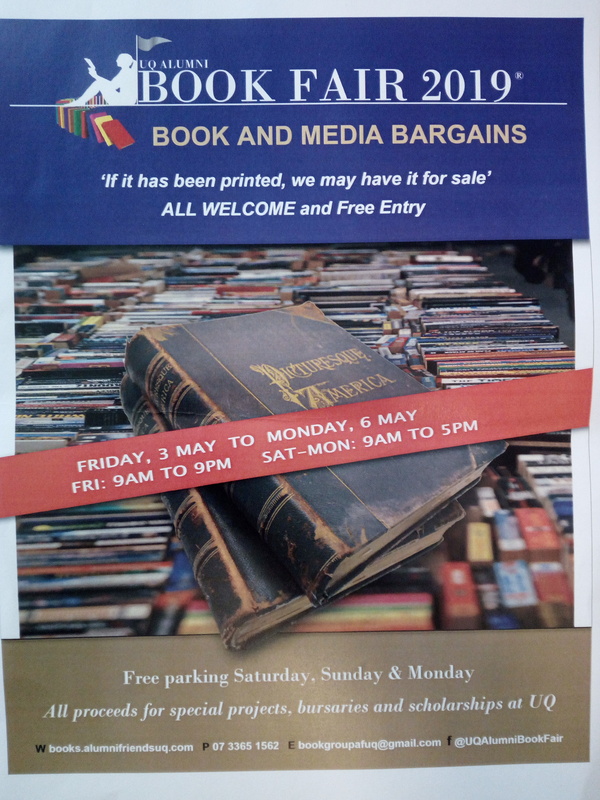 An enlightening literary look at events on the Victorian/New South Wales border; interesting books and even more interesting authors, and a bookshop with the perfect name. Having written the first draft of my Memoir for my own need to make sense of the estrangement from one of my sons and subsequent personal upheaval, I was in the middle of a couple of years of therapy in 2016 when I attended the WAM Writers’ Festival. There was a focus on Memoir Writing and one of the published authors, Helena Pastor, had experienced this situation with her eldest son. I wanted to hear what she had to say about her book “Wild Boys: A Parent’s Story of Tough Love“, and how she found the words that were past the raw pain and confusion, which no-one would want to read. I came to realise at that time, I was still too immersed in my own recovery. You have the month of September to sign up to the new Indigenous Literacy Day fundraising campaign and fill your virtual shelf with books for children in remote communities. Participate in the launch on Wednesday 5 September and discover how to fill a bookshelf for children in the remote Australian outback. It’s something new, something a little different, something the Indigenous Literacy Foundation believes you’ll enjoy sharing with your friends and family, and something that gives you the opportunity of ensuring kids in remote communities have access to quality, new books. Commencing on Indigenous Literacy Day (5 September 2018) the new ‘Fill a Bookshelf’ fundraising campaign aims to raise $300,000 to help ILF gift 30,000 new books to schools and service organisations in remote communities where books are scarce. Sign up online to create a fundraising page and receive an empty virtual bookshelf. Change the lives of Indigenous children. Your donations will help buy new, carefully selected books for children who have none. To put it quite simply – without your support, in a very real sense – bookshelves in remote Indigenous communities are empty. All children in Australia deserve the same opportunities – in education, employment, health and wellbeing. Evidence shows that literacy is the pathway to CHOICE for these opportunities, and BOOKS are the building blocks for literacy. If you believe this too, sign up today! I BELIEVE – SIGN ME UP ‘Fill a Bookshelf’ and celebrate Indigenous Literacy Day! Indigenous Literacy Day is a national celebration of Indigenous culture, stories, language and literacy. Indigenous Literacy Day aims to raise awareness of the need to support literacy in remote and isolated Indigenous communities of Australia. ‘Moli det bigibigi’ (Molly the Pig) a new children’s picture book written by Karen Manbulloo, from the remote Binjari community near Katherine in the Northern Territory. Written in Kriol and English, ‘Moli det bigibigi’ is a story based on a real-life pet pig of the Binjari community, found in the bush by Karen’s brother. Don’t you love being on the verge of discovering a new author, that feeling of anticipating! 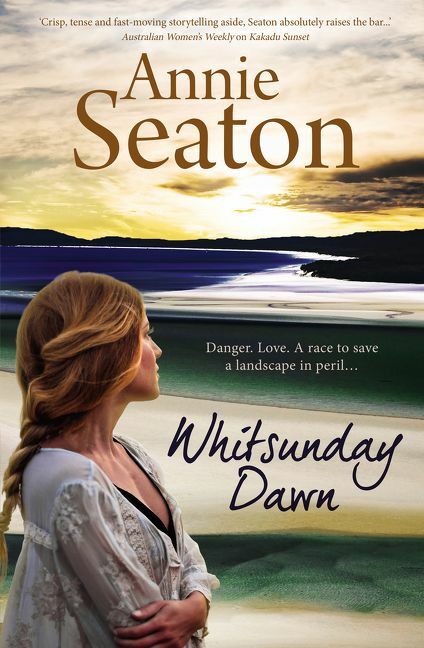 Look at the beautiful location where romance writer Annie Seaton is holding the book launch for her latest release Whitsunday Dawn––in the Whitsunday Islands at beautiful Coral Sea Resort. 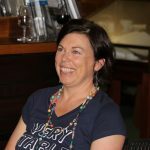 “Ecological impact, divided loyalties and the pristine beauty of the Whitsundays under threat, can mining spokesperson Olivia Sheridan expose the truth in time?” Author Annie Seaton brings to life a new era of romance and eco-adventure. Perfect for fans of Di Morrissey and a sun-kissed tropical lifestyle. As WP readers will know, I’m not usually a romance reader but I’m rather taken by the beautiful location of this all-Australian story. Watch out for my review. On her website Annie says “I am truly blessed to live by the beach on the east coast of Australia. I am following my lifelong dream of writing, and discovering that readers love reading my stories as much as I love writing them is awesome. It’s what keeps me at my desk each day when the garden and the beach are calling to me! All astride upon the back of old grey Dobbin? What must Dobbin think of it––three upon his back? Billy holding on behind, his legs out straight. Now they’re coming back from school, jig, jog, jig. Little Billy up behind, his legs out straight. Poem by Clarence Michael James Dennis, better known as Australian poet C J Dennis (Sept 1876 – June 1938) who had a variety of jobs, from bar tender, secretary to a senator, to publisher and editor. He is fondly remembered for the humorous stories and verse he wrote for big city newspapers and was dubbed ‘laureate of the larrikin’ which means he penned prose about boisterous, unruly people. GBW. Ever get poetry nostalgia? Australian school children learn poems by C J Dennis, Henry Lawson, Banjo Paterson and many more. Often a particular poet’s verse follows them through life, even though their lives are nothing like the rough and tumble era in which these pioneer poets wrote. Changes were afoot in Australia in late nineteenth/early twentieth century and were reflected in the country’s poetry. In the evening, after dinner, someone would recite a poem or two. Years later, I grew up with Banjo Paterson’s ‘The Man From Snowy River’, a rollicking ode to bush men, stock riders, the dangerously rugged land and the great value of horses. Slow Clothing reflects author and refashion advocate Jane Milburn’s own unique style, independent of “fast fashion” trends. Upcycled from denim jeans, the dress Jane wore during her talk at a local BCC library had the potential to look strange but was distinctive and quite beguiling. Jane, sustainability consultant and founder of Textile Beat, touched on several key elements during her talk––environmentally unfriendly fabrics and dyes; sweat shop labour; landfill; passive fashion; synthetic vs natural fibre; signature style and minimal wardrobe. Hot topics included recycle by exchange, shopping tips, Sew It Again mending and creating new from old. Jane tends to hoard fabric offcuts and used buttons, and has a passion for real cotton thread. Rethinking clothing culture doesn’t mean wearing your clothes until they fall apart at the seams, it means mindful immersion, repairing and refashioning your garments. In her book Slow Clothing: finding meaning in what we wear Jane shares insights and upcycling advice. She has created templates like Upcycled Collar and History Skirt, guiding home sewing conversion of a beloved garment to reflect the changes in our lives. To provide meaning and story to her own favourite pieces, Jane Milburn restyles and sews her clothing by hand. Currently testing t-shirt cotton drawstrings as an alternative to underwear elastic (elastic is made from synthetics) Jane stitches everything by hand. Help! I can hear you say, nobody has hand-sewn an outfit since the mid-twentieth century––except maybe Vivienne Westwood––but don’t panic, Jane’s book provides testimonials, illustrations and clear instructions for eco-dyes and upside-down jumper skirts through to sewing on a button. Eco-fashionistas unite! Although Slow Clothing is a multifaceted, easy-to-read book with positive chapter headings (Purpose, Authenticity, Creativity, Action, Autonomy, Reflection) amid the ingenious apparel, I am missing a frivolous note, perhaps a ball gown? On a serious mission, Jane has created a Slow Clothing Manifesto with ten tags to keep in mind when out shopping: think, natural, quality, local, few, care, make, revive, adapt, salvage. Quotes from Jane embody the Slow Clothing philosophy “Slow Clothing brings wholeness through living simply, creatively and fairly” and “We buy thoughtfully, gain skills, and care for what we wear as an embodiment of ourselves.” Personally I am hoping to see people clutching their Slow Clothing Manifesto cards at an op shop near me. Unfortunately I didn’t get to ask Jane Milburn how we go about combating the greed of designer labels. But the clear message is––help reduce landfill by upcycling your clothes to reflect your own unique style. The 2018 National NAIDOC Poster was designed by Cheryl Moggs, a Bigambul woman from Goondiwindi, Queensland. Cheryl drew on the history, courage and resilience of Aboriginal and Torres Strait Islander women to educate others. The artwork (tarmunggie – woman) has three overlaying images, connecting dreamtime, culture and knowledge. Theme: NAIDOC Week 2018 celebrates the invaluable contributions that Aboriginal and Torres Strait Islander women have made – and continue to make – to our communities, our families, our rich history and to our nation. “This artwork portrays the courage and resilience of Aboriginal and Torres Strait Islander women. From the ripples of fresh water and salt water, across the travel pathways and song lines of our traditional lands and skies”. Background: NAIDOC Week celebrations are held across Australia each July to celebrate the history, culture and achievements of Aboriginal and Torres Strait Islander peoples. NAIDOC is celebrated not only in Indigenous communities, but by Australians from all walks of life. The week is a great opportunity to participate in a range of activities and to support your local Aboriginal and Torres Strait Islander community. Origin: NAIDOC originally stood for ‘National Aborigines and Islanders Day Observance Committee’. This committee was once responsible for organising national activities during NAIDOC Week and its acronym has since become the name of the week itself. Find out more about the origins and timeline history of NAIDOC Week. Find out the history of the Australian Aboriginal flag and the Torres Strait Islander flag under Australian Flags. Awards: Each year there is a different focus city for the National NAIDOC Awards Ceremony. This year the focus city of Sydney will start NAIDOC Week with the 2018 National NAIDOC Awards announced at a black tie ceremony and ball. National NAIDOC Poster Competition and the NAIDOC Awards recipients are selected by the National NAIDOC Committee. To learn more about NAIDOC Week activities in your area, contact your nearest Regional Office. Here’s a map of Queensland and video of Brisbane City which makes me think I live in a pretty good place. Nomad Girl of The Jasmine Edit films short, interesting videos around the world. She makes it look like fun; maybe I could make a video, too? Oops, just noticed a spelling error near the Great Barrier Reef. My short story mentions a rural event known as a show. Alternate names can be exhibition, county fair or agfest. Looks of disbelief washed across the children’s faces. Robbo’s face shone with a self-satisfied smile. Next to his work boots lay Dugger, his Labrador dog, who raised an eyelid then went back to sleep. A snort came from school teacher, Miss Evelyn, and all eyes turned to her as she gathered up her patchwork squares. One of the younger children put his hand up. Robbo said “Yes” at the same time Evelyn snapped “No” and the young boy retracted his hand in disappointment. “Can you prove it?” asked Angela, an older girl with jet black hair and thoughtful eyes. She was one of many third generation Brookfield students whom Miss Evelyn had known from babyhood. Robbo was a well-known local figure, a carpenter by trade who could turn his hand to any odd job around the residences in the area. He and Dugger were a volunteer Story Dog team at the local school. Today they had veered off topic and instead of the slow readers reading, Robbo had tantalised them with an opening salvo to his tale. The children chuckled nervously and settled themselves back on the kindergarten cushions. Some of the older boys had objected to being in the kindy room but the seating arrangements were more comfortable than their classroom, currently overflowing with paintings and craft waiting transfer to the Show pavilions. Miss Evelyn settled herself down again like a kookaburra shuffling her feathers. A couple of the young ones inched closer to her, hoping for motherly support should the need arise. “Okay,” Robbo rubbed his hands together. “Here goes!” He leaned forward and rested his elbows on his knees. A security thumb or two was popped in, soft toys were hugged and someone let off a smell. Robbo shook his head. “No, they were still there. And you know what?” He raised his calloused hands high in the air above his head. “They had turned into giant wallabies.” Then, for extra emphasis, he stood up and reached for the ceiling. His fingers almost dislodged a butterfly mobile but it added to the atmosphere as they fluttered wildly around his uncombed hair. The group froze; Frederick crouched ready to run. Robbo pulled a face and told them the crow was another story. Sitting down, he attempted a sage storyteller voice. Miss Evelyn pursed her lips and shushed them. Dugger shifted position on the floor and put his bony jaw on his paws, the seams of his orange vest creaking beneath him. Nobody saw Miss Evelyn trying to swallow a laugh and regain her composure. “Surely the local fire brigade would have arrived by now?” she said. “Phew, that’s a relief,” said one of Angela’s younger siblings and everyone laughed. Apparently they shared similar thoughts – the cake pavilion housing their entries sitting under cling wrap on paper plates. “And sideshow alley,” thought Miss Evelyn. Robbo avoided her gaze, patting Dugger and adjusting his leather collar. Judging by the looks Miss Evelyn saw on the younger faces, caps nervously twisted between little fingers, they did not want proof. The collective chatter was enough to wake Dugger. He got to his paws, shook his furry head and looked around. He let out a sharp bark and ran to the open door. With a slight pause to sniff the air, he bounded out of the room. The space Dugger left seemed suspended, a motionless void. The electronic school bell sounded, breaking the spell. As the children helped stack cushions in the corner, Miss Evelyn turned to Robbo. AUTHOR NOTE:  This short story is dedicated with love and respect to Kookaburra Kat of KR, a long-time friend who supports and encourages my literary endeavours and is a passionate wildlife warrior, nurturing and caring for all creatures. GBW. “My name is Glen Miller, I am a Board Director of the Indigenous Literacy Foundation and a descendant of the Butchulla people of the Fraser coast (Queensland). Today we acknowledge the 10th anniversary of National Sorry Day, a milestone in Australia’s history. This National Day of Healing is at the heart of our steps towards reconciliation. Tomorrow marks the beginning of National Reconciliation Week and we reflect on this year’s theme: ‘LEARN, SHARE, GROW – DON’T KEEP HISTORY A MYSTERY’. Here, we are invited to explore our past as a country; learn, share and acknowledge the rich histories and cultures of the First Australians; and develop a deeper understanding of our national story. “For many thousands of years the Butchulla people have been travelling between Queensland’s K’Gari (Fraser Island) and the mainland; catching winter mullet in stone fish traps set along Hervey Bay and trading with the mob up around the Bunya mountains. There are three laws that the Butchulla people live by: 1) What’s best for the land comes first, 2) If you have plenty, you must share, and 3) Do not touch or take anything that does not belong to you. “While these were the laws that were taught to the children, they were also told stories that describe the origin of the land: The Legends of Moonie Jarl. These stories tell how the wallaby got its pouch, how the boomerang was invented, and how the little firebird came to have that bright scarlet spot on its back. These stories were told to me as a boy by my uncle Wilfy in the The Legends of Moonie Jarl. The year was 1964 and it was the first Aboriginal children’s book published and authored by Aboriginal people. “Three years after its publication, Indigenous people were finally recognised as Australian citizens and 50 years on the stories continue to be shared among the Butchulla people. 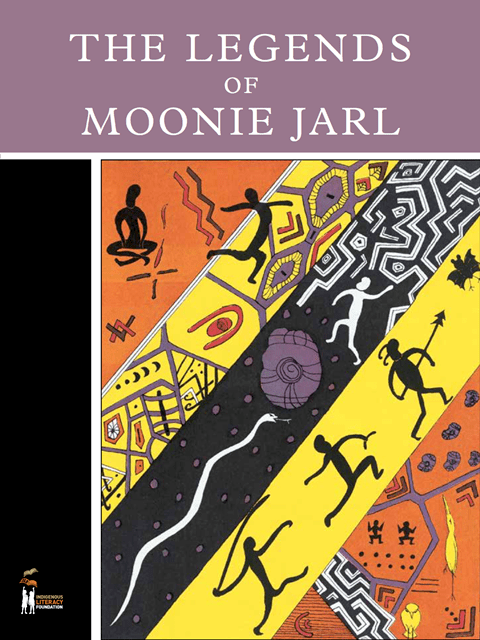 In 2014, our Foundation re-published The Legends of Moonie Jarl so now the stories are available to share with all Australian children. “It was written by Uncle Wilf Reeves and illustrated by my mother Olga Miller” – Glen Miller. 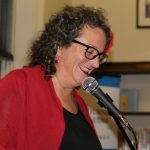 Sisters in Crime Australia’s 25th Scarlet Stiletto Awards were launched by Dr Angela Savage at Melbourne’s Athenaeum Library on 27 April, 2018. Almost $10,000 is on offer in prize money. The event included dramatic readings of three winning “body in the library” stories – “Jane” by Narrelle M Harris (read by Jane Clifton), “Caught on Camera” by Jenny Spence (read by Susanna Lobez) and “Brought to Book” by Kath Harper (read by Leigh Redhead). Dr Savage (below), the 2011 shoe winner and now Director of Writers’ Victoria, declared the awards “a milestone for Australian crime – at least of the literary persuasion”. The awards, she said, had “spring-boarded the careers of many writers, including myself. To date, 3084 stories have been entered with 23 Scarlet Stiletto Award winners –including category winners – going on to have novels published. “Like many of Sisters in Crime’s best ideas, it sprang from a well-lubricated meeting in St Kilda when the convenors debated how they could unearth the female criminal talent they were convinced was lurking everywhere. The success and longevity of the Awards have been hugely dependent on the generosity of Australian publishers, booksellers, the film and television industry, authors and other parties. Sisters in Crime had been uncertain that the launch would go ahead because, at the eleventh hour, the First Prize Sponsor, Bonnier/Echo Publishing, was closed down by its overseas arm. Luckily, Swinburne University and the ever-resourceful Dr Carolyn Beasley, Acting Chair of the Department of Media and Communication, stepped into the breach. There are two brand-new awards on offer this year: Writers Victoria Crime and Punishment Award ($660) for the story with the most satisfying retribution (the winner gets a three-month spell in prison in the guise of a studio residency at Old Melbourne Gaol) and the International Association of Forensic Linguistics (IALF) Award for Best Forensic Linguistics Story ($1000). IALF President, Dr Georgina Heydon (left) from RMIT, told the crowd that the award was designed to foster understanding of forensic linguistics which uses a scientific approach to language analysis in legal and criminal investigations. Nine collections of winning stories are available from Clan Destine Press. Closing date for the awards is 31 August 2018. Entry fee is $20 (Sisters in Crime members) or $25 (others). Maximum length is 5000 words. The awards will be presented at a ceremony in Melbourne in late November. To download an entry form, pay the entry fee and read the FAQs, click here. Visit the Sisters in Crime website and sign up for their newsletter. It would be criminal to miss out on this great opportunity!